Tanks and aircraft get the lion’s share of the limelight when it comes to warfare, but troops couldn’t advance en masse without a convoy of study, rugged trucks. 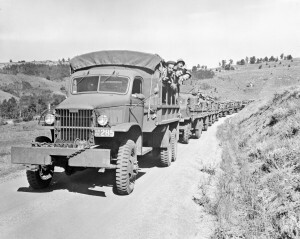 In the European theatre of WW2, that truck was (more often not) the three-axle, 6×6 GMC CCKW-353, affectionately known as the Deuce-and-a-half due to its 2.5 tonne payload rating. A few hundred thousand of these came in handy in the mid-1940s. Powered by a smooth and reliable 270 c.i.d. inline six (making 91 hp and 216 lb-ft), this GMC saw the U.S. and Canada through WW2 and Korea. Given the massive numbers of Allied troops pouring into Europe in the wake of D-Day, huge numbers of transports were required. Between GM and GM of Canada, 800,000 examples were cranked out in every possible configuration. 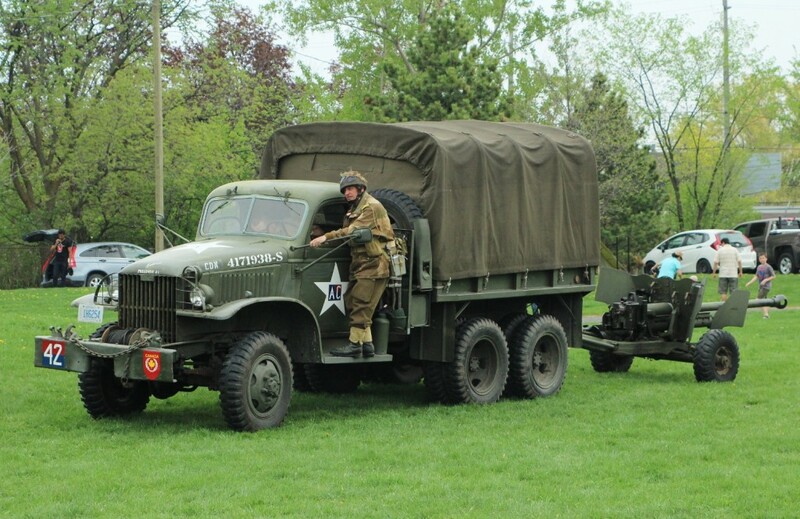 The GMC provided a stable platform for carrying and towing, and besides its most common role as a troop carrier, saw use as a water and fuel tanker, surgical van, and mobile anti-aircraft gun installation. Though replaced in official service in the early 1950s, CCKW-353s were a common sight on military bases well into the 1960s. Count on the crafty Germans to come up with something as innovative as this. After the Axis power decided that expansionism was the way to go, the German armed forces found themselves needing more than just tanks, trucks, and staff cars to get around. After all, there’s a lot of narrow roads and water in Holland. Enter the lowly People’s Car, which offered up its underpinnings and drivetrain for the VW Type 166 Schwimmwagen, a light, agile car that could double as a motorboat (thanks to a watertight body and a propeller mounted on a driveshaft extension). 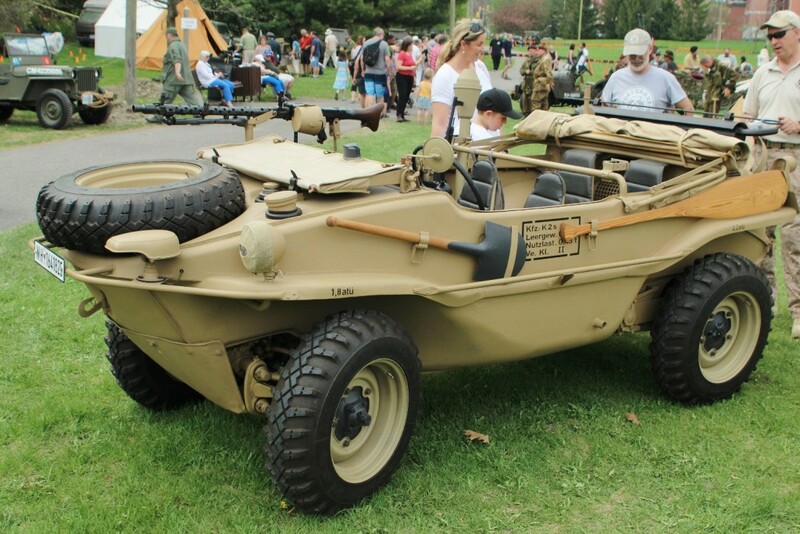 And so, the most mass-produced amphibious car in history was born out of wartime necessity. Powered by a 1.1-litre flat four, a total of 14,265 of the bathtub-like vehicles rolled, then swam, off the assembly lines. Yes, that paddle is there for a reason. The Schwimmwagen could make steady (but slow) forward progress in the water, but backing up required basic canoe training. If lost, the shovel would suffice for maneuvering the tiny ship. 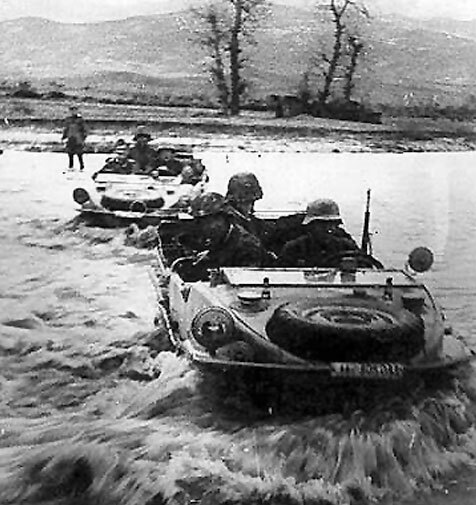 On dry land, a four-speed transmission and two-speed transfer case (with 4WD in 1st) helped the Schwimmwagen navigate roadways and mixed terrain. 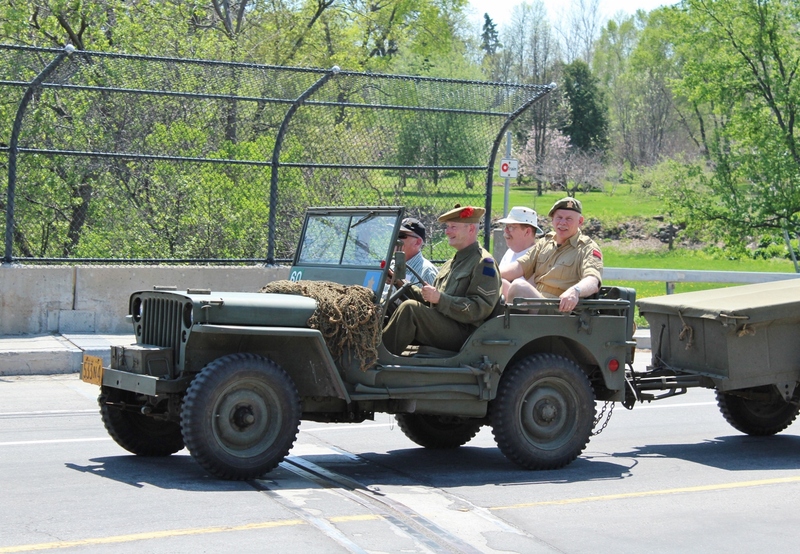 While it provided next to no protection to occupants and was puny compared to other road-going machines of the era, a passenger-side 8-millimetre machine gun helped sooth the driver’s ego. We can all thank Hitler for unwittingly introducing the world to the Jeep – an iconic vehicle whose lineage continues to this day in the Wrangler. 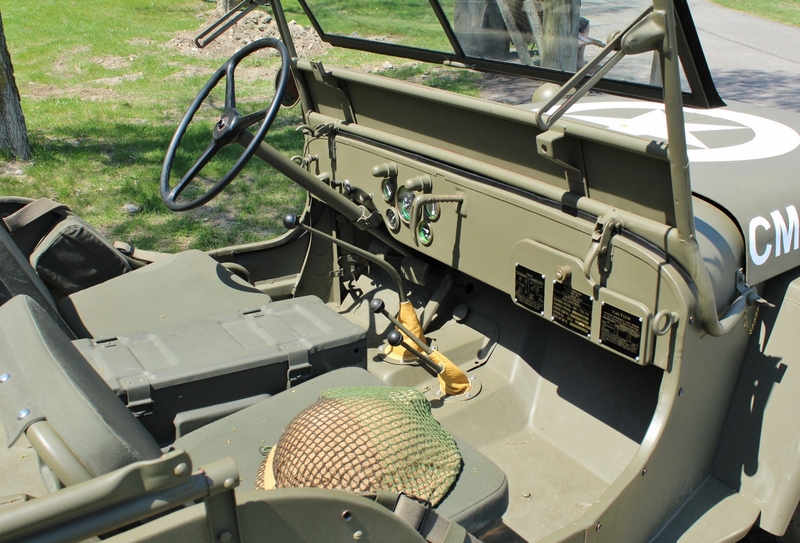 With entry into WW2 seeming like a sure thing, the U.S. Army appealed to the auto industry for designs of a small, durable four-wheel-drive scout or reconnaissance car of light weight and adequate power. 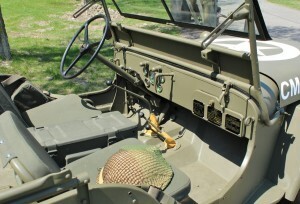 A startan interior was just what the Army ordered. Not custom sheepskin shift boots on this restored example. Tiny, failing car company American Bantam submitted blueprints five days later, which impressed the military so much that they sent the designs to Ford and Willys-Overland for refinement, and ultimately production. Powered by a Willys-sourced ‘Go Devil’ 2.2-litre four cylinder making 60 hp and 105 lb-ft of torque, the vehicle went into extensive production starting in 1945. Because production was split between two companies, Willys designated their model the MB, while Ford called theirs the GPW. The only tell-tale difference between the two was the nine-slot grille on the Ford, versus the quintessential seven-slot grille on the Willys. 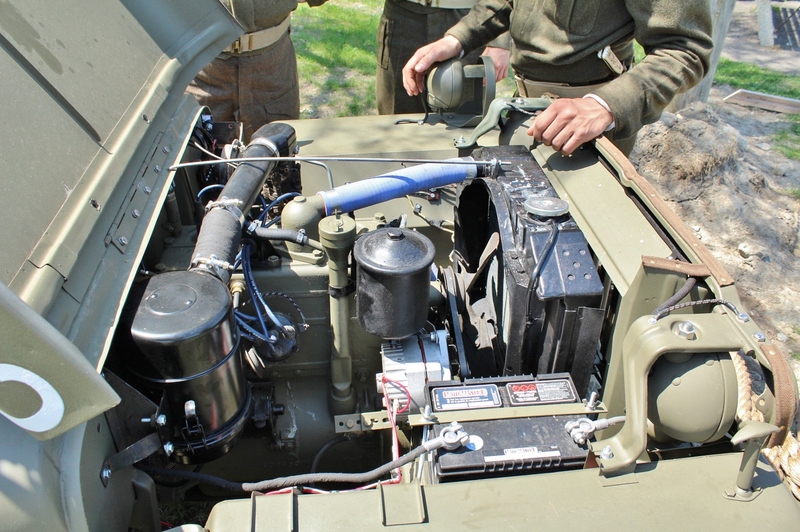 The Willys ‘Go Devil’ engine was chosen for the Jeep due to its small size and robust power. In all, Willys assembled over 359,000 of the do-anything runabouts before the end of the war, while Ford produced over 277,000. Nowhere in official documents was the word ‘Jeep’ mentioned. 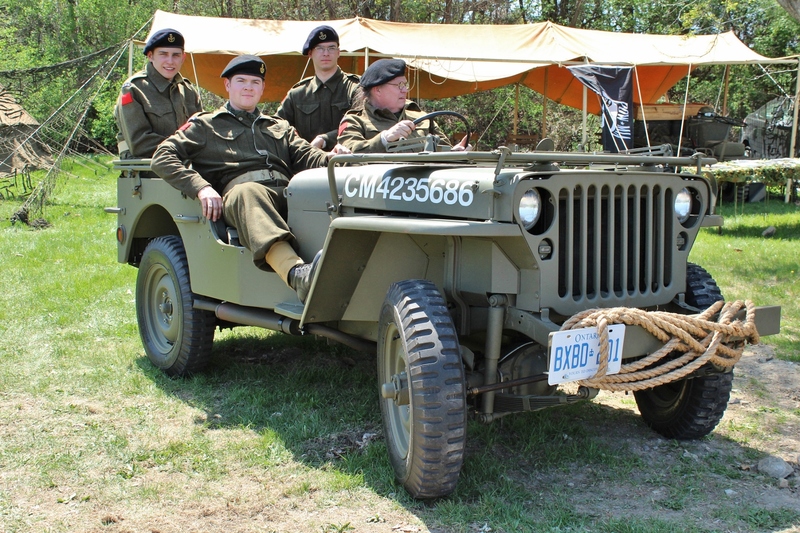 There’s much speculation about how the car – and eventually the company – came to adopt the name; most of it centres around slang used by servicemen and a high-profile 1941 media event in Washington, DC. Whatever the origin, the word ‘jeep’ became synonymous with small, rugged 4×4, sparking a worldwide movement that led to the creation of the Land Rover and Toyota Land Cruiser. After the war, the popular civilian Jeep (CJ) found itself on quite a wild ownership ride, changing hands several times. This 1947 Willys, found on a farm in the Yukon, was painstakingly restored to 1944 specs (including the installation of a WW2 Ford grille). After Willys-Overland, the CJ was built by Kaiser-Jeep from 1953 onwards, followed by a long stint at American Motors Corporation (AMC), before being purchased by Chrysler Corporation in 1987. The ride didn’t stop there, as Chrysler then embarked on its own ownership roller-coaster. From DaimlerChrysler AG, though the dismal Chrysler Group LLC years (which was followed by bankruptcy) and eventually to its current home in Fiat-Chrysler Automobiles (FCA), the Jeep division clearly has nine lives, and many new dads. The fact that the division has remained in such demand over the decades – and created such a lifestyle around its products – should make the original designers of the Jeep proud. This entry was posted in Spotted in the wild and tagged Chrysler, Ford, Jeep, Willys on May 16, 2015 by Steph Willems.